HVAR – High Velocity Aircraft Rocket | Shortfinals - aviation and more! 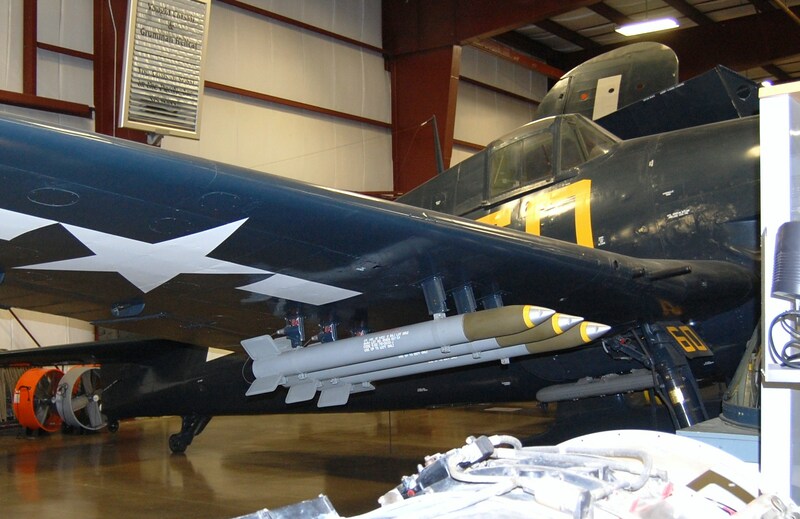 I have received a request to show the HVAR – the High Velocity Aircraft Rockets – carried by the F6F-5K Grumman Hellcat at the New England Air Museum. I am always happy to comply with requests for particular subjects (within reason), so here we are! The predecessor of the HVAR was the FFAR (Forward Firing Aircraft Rocket); this had a 3.5 inch diameter rocket motor fitted with a 5 inch shell. The resulting rocket was ‘slow’, at only 485 mph, and a better alternative was needed. A new rocket body of 5 inch diameter, using 24 lbs of propellent, was devised and first tested in December 1943. This new rocket carried a modified 5″ shell ‘warhead’ (carrying 7.8 lbs of explosive) with a MK149 nose fuse, and the total weight of the rocket was 134 lbs. There were two types of HVAR, a General Purpose rocket with both base and nose fuses, and a Semi Armour Piercing version with nose fuse only. After WW2, two more variants were added to the production line, an Anti-tank round with a shaped charge warhead, and a General Purpose type with a proximity fuse. The velocity of the HVAR went up to 950 mph, with a ‘slant range’ of approximately 3 miles. During the Korean War, pilots of F-51 Mustangs were advised to fire their rockets in a 60º dive, the optimum range being around 2,500 ft from the target. The first use of the HVAR was not, however, by the US Navy, but by the 9th Air Force, against German targets near St. Lo, France, in July 1944, during the Battle of Normandy. These USAAC versions of the rocket had a steel-finished rocket motor body (as opposed to the grey-painted USN type) and a special set of tail fins, complete with grooves and extra grounding wires, which enabled the rockets to be ‘stacked’ one on top of the other, and a larger load of these weapons to be carried; this arrangement was particularly used by the Lockheed P-38 Lightning. By the time production was phased out in 1955, no less than 1,000,000 rockets had been made, and they had been used against targets on land and at sea in WW2 and in Korea. This was an incredibly effective weapon – one whose nickname was ‘Holy Moses’, from the reaction of pilots on seeing them explode for the first time! A company called ‘BombsAway’ sell replica HVAR’s to owners of warbirds. They have some excellent photographs and data. Here is their website…. I am working on a project detailing the use of the HVAR (a wargaming project) Do you have research sources which can confirm the use of the HVAR in ’44?